Originally uploaded by Biscuit Maker. Just a preview of what I did this weekend. 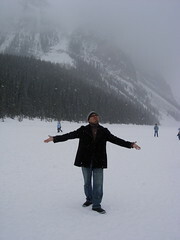 I was at Lake Louise in this photo. Pete Hansen and his lovely family had generously given us a tour of Banff and to Lake Louise before my talk later that evening. The views were magnificent and we--along with the Woodmans, Woody and Maria--had a marvelous time. More on the Banff Centre and the magical people I met there next post. Still just acclimating to being back and working. Sort of. If you see Lake Louise (or the rest of the Rockies) in the summer, you'd be equally blown away. The waters are such a bold blue/green (like many of the other Rockies lakes, rivers, and streams) that they really are breathtaking. However, so are the prices of accomodations there! I really enjoyed your presentation Ronaldo. It was a powerful trip back to the oral tradition of storytelling. You stripped away layers of pretext, and went straight to the heart of story. Very empowering. Ronnie, your presentations really did get to the bottom of things very eloquently. Thank you for taking the time to attend. For those of you working in sequential art in Toronto who missed it, keep a lookout for a new 'info only' blog coming soon. I'll try to post any and all workshops, call for submissions, etc. of this calibre so everyone gets a chance to attend and improve their work. The Banff Centre didn't have any liasons in Ontario to spread the word, and I found out at the last minute. I'll try to fix that so everyone gets a heads up on future opportunities. Will you post your workshop material or at least "excerpts". It will be interesting for us "layman" folk. Videotape the presentation, sell them to us, and make a million dollars. Seriously though, wish I could have seen it...looking forward to reading about it. And Canada looks quite beautiful by the way...they actually have real weather up there. Chad--Rick's quite an inspiring guy himself. He should know this. Lake Louise, man. I'll think of what it looks like in the summer. Gord--Thank you. I had a blast. You guys did most of the stories. I just cleared the area for it to happen. Charles--I am planning on a separate page for the website that will hold the rants. So, surely, it's ongoing. Justin--Videotape? I don't video well. But maybe a documentary. Something to think about. I'll try to take the talk on the road so I can refine it--maybe even have more stuff to show. I'll post whatever, if ever here on the blog. Thanks. Sorry for this message, but i just want to say that i'm a big fan of your work, and see your drawings makes me want to draw everyday better! here in brasil we don't have how to buy none of your books.. but i'm going to finland, so, there is any of your books avaliable? well, sorry for disturbing, and thanx.